Is Digital Marketing a right Career ? Before i tell you whether Digital Marketing is a right career or not. Let me first explain to those people who just heard the term " Digital Marketing " and thinking what the heck it is? An Art to sell a product or service using the electronic medium by using and analyzing the data that we get from the customer's behaviour is called Digital Marketing. Sounds Good.. Isnt it? Ever Notice Google Search Ads, Mobile App ads , Youtube Ads , Facebook Sponsored ads and etc ? These are nothing but different form of Digital Marketing . 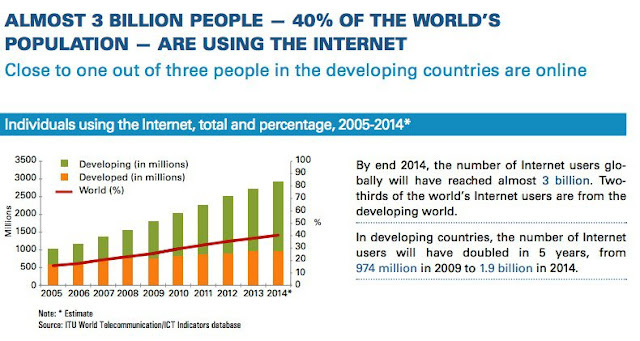 Internet is growing at very fast pace by the end of 2014, Internet users reached to 3 Billion and by 2020 it is expected to reach 6 Billion ...Whooping Number!! So...if every third person on this planet is using Internet thats opens the gate for advertising & marketing in this spectrum. Companies from small startup to MNCs are spending huge money in digital marketing of their brand,product or service as digital medium not only help them to sell a product but also help them to build a social and virtual relations with them. Setting Up a Digital Marketing campaign is easy,affordable,cost-effective and best part is you can analyze the whole big data of your customer behavior ..What they like? What the disliked and How can you improve it. 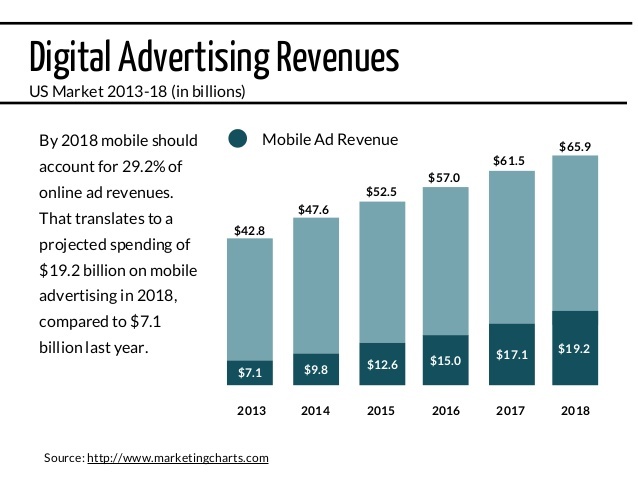 According to Marketingcharts.com reprot US market alone witness the Mobile ad revenue of $52.5 Billion and is expected to increase to $65.9 Billion . This stats clearly shows that companies no matter small or an enterprise will gona spend triple the amount in their Digital Marketing budget. How can you be the part of this Billion Dollar booming business ? Simply by learning the Art and Science of Digital Marketing. Follow Blogs like Searchengineland.com , DigitalDeepak.com. Practice ! Practice ! Practice ! Learn and implement all the things yourself more practicals you do more experience you will have. Remember, Internet Marketing or Digital Marketing is constantly changing industry so its not preferable to learn any xyz book on Digital Marketing as the content gets old even before the book get published. Digital Marketing is undoubtedly the right career path if you love Technology and Marketing . Digital Marketing is the demand of future and there will be huge demand of talented Internet Marketing Magicians . Pretty! It was really a wonderful blog. Thanks for the provided information http://packro.com. I am pretty much sure about getting the method of attracting the large number of visitor on your website and this method is the SEO services by consuming the SEO services you can easily increase the number of visitor on your website but in only one condition that you have to consume the quality services of SEO and you can only get this type of services from here http://seoanalytics.pro. Thanks for sharing such a nice informative blog about Digital marketing. Please keep on updating. No.1 App Development Services in Massil Technologies. Please visit www.massiltechnologies.com for more information. What a interesting article about digital marketing. thanks for sharing, keep updating. Great information about Digital Marketing Career. Keep update. Thanks for sharing good things. Excellent Blog... The information you shared is very effective for learners I have got some important suggestions from it, Keep Sharing such a nice blog. Very helpful information you shred. Thank you.